I’ve been trying to use up all the winter squash I bought right at the end of the farmer’s market season. It is keeping beautifully down in my cellar, but I know that sooner or later I will need to address it all. One of the first I bought was an acorn squash, so it was at the top of my list even though I have disliked them all my life. One upside of acorn squash is that they are reasonably sized for stuffing. Most of the recipes for stuffed squash out there involve grains and nuts and sausage, which just wasn’t piquing my interest this week. However, I did find one rather popular recipe cited at 101 Cookbooks, which intriguingly calls for using the squash as a vessel for roasted corn pudding. My adjustments to the recipe were using two whole eggs, substituting sweet onion for green, omitting the aniseed, and stirring a little grated Cheddar into the pudding (accidentally, I admit, but it worked out well). Heidi may be a vegetarian but we aren’t, and I didn’t relish the thought of acorn squash for dinner with no meaty escape plan. So, to go with the squashy corn puddings, I decided to cook up some pork. Jeremy brought home some little vacuum-sealed pork sirloin tip roasts from Costco for the first time last week, and after using one to make a dinner of pork schnitzels and spaetzle with apple compote, it was high time to try roasting one whole. Just for some festive holiday fun, I decided to gift-wrap it in a blanket of prosciutto and sage leftover from Thanksgiving—no additional seasoning necessary. It roasted for about an hour alongside the squash until it temped out at about 150F. The finishing touches were broiling a little Cheddar cheese over the corn puddings and using the flavorful pork drippings to make a creamy, mustard-scented sauce. This was a really satisfying meal. Turns out those little pork roasts are great—lean, juicy, and just the right size for our little family. (The fact that individual vacuum-sealing makes them store and freeze nicely is just a bonus.) 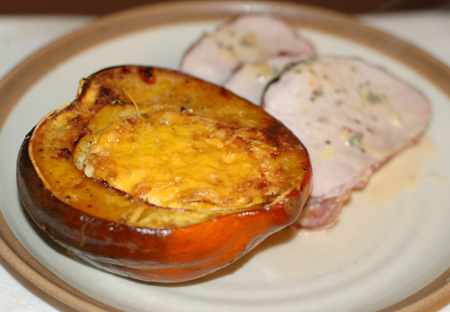 And the flavors in the pork were an excellent complement to the acorn squash and its savory pudding. I ate all of my corn pudding, plus a good portion of the extra that got roasted off in an adjunct loaf pan—the squash serving vessel, not so much. 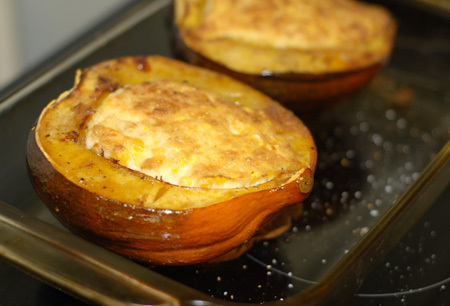 After a few tentative bites, I decided that acorn squash is probably always going to be on my persnickety list, but at least I have my husband to wolf it down on my behalf! Preheat oven to 400°F. Liberally pepper pork roast on all sides. Lay out slices of prosciutto, with their long sides slightly overlapping; cut an additional slice in half to form a T-shape. 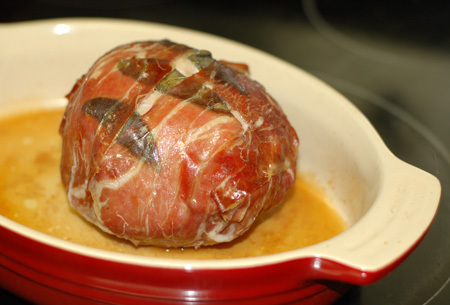 Arrange sage leaves across the prosciutto, set down the pork roast in the center, and wrap the prosciutto around it. Place in a small roasting pan or casserole and rub lightly with olive oil. Roast pork 50 to 60 minutes or so, until done to an internal temperature of 150°F; this will vary depending on the size of your roast. Remove to a plate and allow to rest under foil for 15 minutes. While the pork rests, make the sauce: Pour the drippings into a small saucepan and if necessary, add chicken stock to equal 1/3 C. Stir in remaining ingredients and simmer until reduced to a saucy consistency. Taste and adjust seasonings if desired; the prosciutto is salty enough that it may not be necessary. You can also strain the sauce if you want a more elegant look. Slice the pork and serve with a spoonful of sauce. MMM!!! What an interesting dish! I love it!